The PILOTVAP®-6 is a patented pendulum system rotary evaporator. The floating rotating flask reduces mechanical stresses, to achieve constant tightness and a powerful distillation result, even under permanent operation. Hydraulic damping system for the rotating flask with drive system (patented), to increase the performance, when drying powders. Surface treated glass flanges for maximal vacuum stability. Vapor temperature alarm, to automatically shut off the water bath. Implosion protection hood for the rotating flask, made of transparent polycarbonate. The pendulum system makes the rotating flask float in the water bath, to guarantee highest performance, easy handling and maximal reliability. 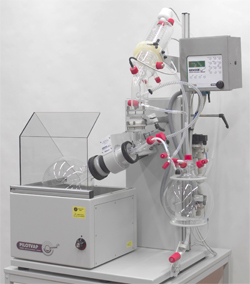 fully automated rotary evaporator POWERVAP®.